Biden is another one that i hope would go pack his boots already ... tired of these old white men. Based on what? He seems to be the most popular politician in America right now. Every Democrat candidate is just a copycat version of the real deal so we msy as well go for the man himself. Is that the only objection you have? Hes old and white? Youre either trolling or just pure silly. I find it pretty pathetic this is the only objection the American media or establishment can find to him either yet bring an old white and pretty immoral candidates herself, Clinton faced few criticisms and a rigged primary process. She was handed the nomination on a plate with little actual examination of her Łąck of morality. Forgive the Polish characters. My phone has a Polish keyboard. PAN Sanders would be proud as he is a Polish citizen himself. This boomer generation is the ******* plague in all honesty ... Hillary, Trump, Bernie, Biden,(Warren is an exception but I don't want her either)..
We need a fresh new face .. the thing all the young'ones have done right in their campaigns is that they don't even mention the name of the evil creature that now resides in the white-house. The first quarter financial reports are due by April 15, and Bernie is expected to have a substantial lead, in part because he was in early when the field was less crowded, but also because of his base from 2016. A problem for him going forward, that he did not have in 2016, is that several other D candidates have adopted some of his policies, particularly on healthcare. Although I think he'll survive that challenge, I don't see him winning the D nomination, much less the Presidency. I was an early Obama supporter, and I'm in behind Mayor Pete. Democrats' 2020 race is already one for the history books: There’s a tighter pack, more diversity, more authentically viable candidates, more early money, and more creative, meaty ideas than anyone expected. Why it matters: This is a big, durable field of candidates with staying power — promising a long, diffuse scramble to define liberalism. It is unfolding in a reality distortion field, with early money and social media attention rewarding a race to the left. Bernie Sanders' formidable fundraising means he starts stronger than expected. Joe Biden starts weaker than expected, perhaps prolonging other candidates' runs. Pete Buttigieg started as a curiosity but now is a true force. He gave a speech about gay Americans last weekend that has been compared to Barack Obama's address on race, for having the potential to "live on past its moment," as MSNBC's Brian Williams put it. Beto O'Rourke's sunniness promised to make him the field's crowd-pleaser, but he now could be diluted by Mayor Pete in competing as the fresh, new thing. Elizabeth Warren has announced a spate of clever, ambitious policy ideas that will keep her in the mix and conversation. Kamala Harris launched with a big bounce, and California's early spot in the primary calendar gives her a superpower you should not undervalue. A top veteran of Democratic politics tells me: "The race has gone to full steam preposterously early." Well, it’s only getting faster and more crowded. Be smart ... The Trump plan is simple: Scream "socialist!" until Election Day and make it a stark choice — and not a referendum on his behavior. He’s betting the powerful swing to the Sanders left will play into his hands. I think it is a great idea to have 20 Dem candidates so that the trumpster in the WH can distribute his punches equally through most of them... the more the better.. I was never a great fan of Bernie (or Hillary) but supported him for a brief amount of time to get the Dems policy to move a bit to the left. I ended up regretting supporting him because he is another boomer that is out for himself. 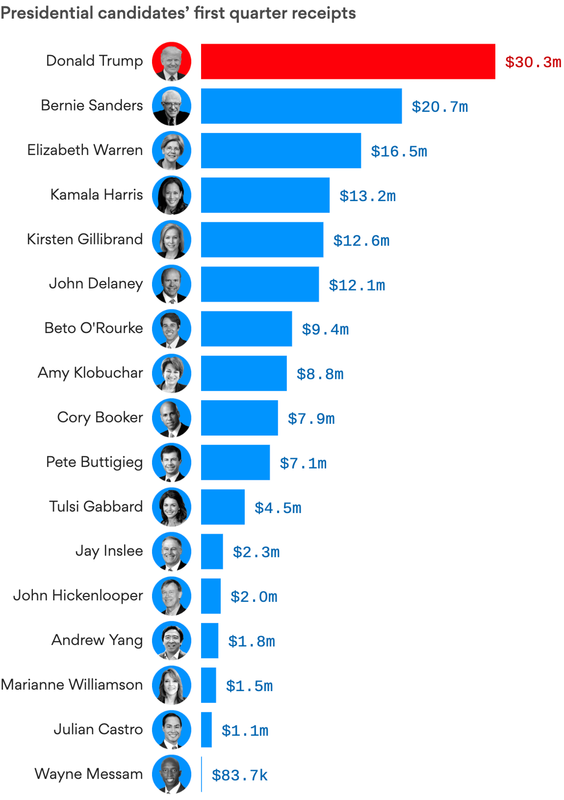 Having lots of money at the beginning of a presidential race — or even at the end — matters much less than it did in the past, Axios' Felix Salmon and Alexi McCammond write. Huge out-of-the-gate dollar advantages for Hillary Clinton in 2008 or Jeb Bush in 2016 didn't help them over the finish line. There's a long history of rich people trying and failing to win elections with money: Meg Whitman, Carly Fiorina, Linda McMahon, etc. Such presidential follies go all the way back to Ross Perot in 1992, and are likely to be continued by Howard Schultz this cycle. David Koch was the Libertarian Party candidate for vice president in 1980! Be smart: President Trump probably could have won in 2016 with nomoney. You can’t put a price tag on free Twitter coverage, free cable coverage and all the stories flowing from both. The bottom line: In many ways, the money primary is not important because money is important, but rather because it helps determine which candidates are taken seriously by the media. A bare minimum of money is necessary to staff a campaign, keep it on the road, and keep its vital functions on track — although Trump might have effectively disproved even that. Beyond that bare minimum, money tends to go in two directions: consultants and TV ads. Candidates still spend the lion's share of their funds on TV ads, because that's where the boomers are, and boomers are very likely to vote. But TV ads are hard to target effectively, and they always come at a premium: Many swing-state local TV stations are happy to lose money three years in a row, just because they know that presidential election campaigns will be like money from helicopters. TV ads have never been less effective in terms of persuading the electorate whom they should vote for — because the electorate has never been this polarized. In 2020, earned (free) media will, once again, be of paramount importance. And this time, the earned media that matters will increasingly be social — especially Facebook and Instagram — rather than TV. While some people are persuaded by TV, many more are persuaded by their friends and peers. On the polling front, my man, Mayor Pete, has moved up from 2-3% a month ago to about 7% today.